The primary field for the Cooperstown Women’s Baseball Classic is Doubleday Field. Just two blocks from the National Baseball Hall of Fame and Museum, Doubleday is a fixture in the Village of Cooperstown, and named after Abner Doubleday, the man often credited with having invented baseball. The grounds have been used for baseball since 1920, on what was Elihu Phinney’s farm. A wooden grandstand was built in 1924, later replaced by a steel and concrete grandstand built in 1939. Today, seating capacity allows for 9,791 spectators. 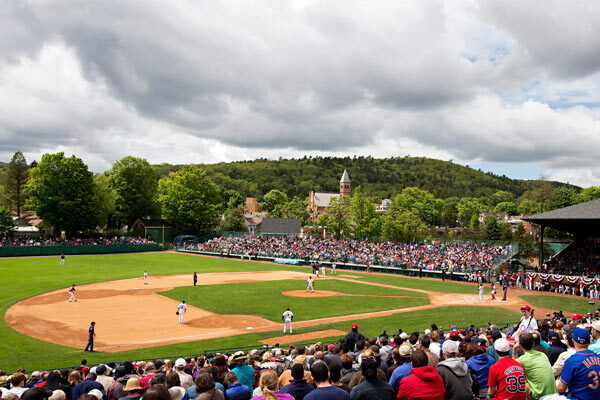 Doubleday Field is located just off Main Street in Cooperstown. Directions: 1 Doubleday Court, Cooperstown, NY 13326. Additionally, teams will practice and play a short drive away in Cobleskill, New York. SUNY-Cobleskill Baseball Field – 30.7 miles away (42 minute drive). The State University of New York College of Agriculture and Technology at Cobleskill has a rich academic tradition that spans nearly 100 years. Today, over 2,500 students are enrolled. The school is home to the club baseball team, the Fighting Tigers. Directions: 107 Schenectady Ave, Cobleskill, NY 12043.